Never has it felt so good to put my head down on my pillow as it does right now! Late night Christmas and grocery shopping has rendered me completely useless. Nornor was a little fussy today, but nothing like yesterday evening. The cold still lingers on but who ISN’T fussy when they have a cold? 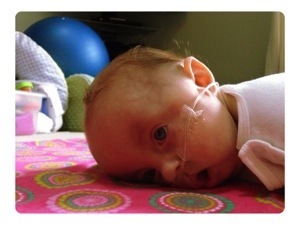 Our nurse stopped by this afternoon for a quick listen of Nora’s lungs and they are clear! That’s always such a relief! She is such a cutie-patooty!! Sick little ones are tough, bless their hearts. Get some rest Momma & as always thanks for sharing this angel! Hi! 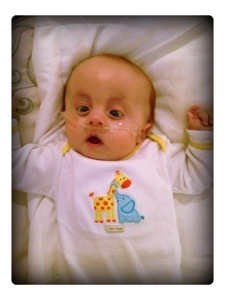 I follow your blog and your Facebook and pray for Nora!! I have debated if I should say somehing and when I saw ur post on her piling today I thought I should. You have moentioned she is very fussy and gassy and on soy. Often children with milk allergies also have soy allergy. My little guy is allergic to milk and corn. He tried 9 formulas and is finally settled on alimentum ready to feed which has no corn and broken down milk. He was very fussy and gassy and had trouble sleeping when his tummy was upset! Just a thought as those symptoms and vomitting can be signs of allergies!! Best wishes and prayers!! You are an awesome mommy!! 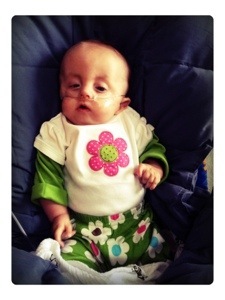 I LOVE THE PICTURE OF NORA IN HER LITTLE FLOWER OUTFIT. 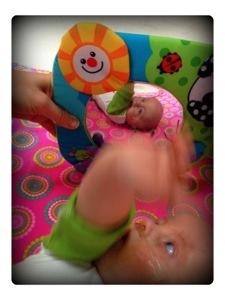 WHAT A SWEET PICTURE OF HER AND HER REFLECTION IN THE LITTLE MIRROR. 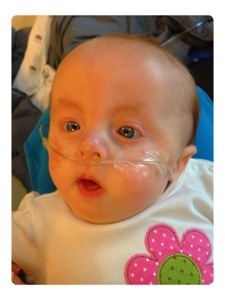 SHE IS SUCH A BEAUTIFUL LITTLE GIRL AND LOVED BY SOOOOO MANY. SO GLAD THE NURSE STOPPED IN AND HER LITTLE LUNGS ARE CLEAR. ALWAYS A GREAT RELIEF!!!!!! YOUR TREE IS BEAUTIFUL. HOPE YOU GET MORE SLEEP TONIGHT THAN LAST NIGHT. COME TO THINK OF IT I AM RUNNING A LITTLE BEHIND, SO MY COMMENTS ARE KIND OF OUT OF ORDER. LOVE AND PRAYERS.